Before a parachute can fly on one of our flagship missions it needs to be thoroughly tested. This blog dives into the testing that is done by the Parachute Research Group (PRG) and will give an explanation of why tests are being done. It is important that the tests represent the envelope in which the parachute is to function. Therefore, we consider the theoretical envelope of the Stratos III and IV recovery systems shown in the figure below. Theoretical flight envelope of Stratos III recovery system. The first and most used platform is the Open Jet Facility (OJF) of the TU Delft. This facility can go up to 30 m/s, which translates to Mach 0.09 and 551 Pa for dynamic pressure (assuming ISA). As can be seen in this only covers the bottom left part of the envelope. However, it still allows the team to get a good idea of the drag coefficient and stability of the parachutes. To help the team in testing at higher dynamic pressures a Mach numbers, two internal missions have been created: PIP (Parachute Investigation Project) and SPEAR (Supersonic Parachute Experiment Aboard REXUS). These missions allow for testing at either higher dynamic pressure or higher Mach number. Test of a parachute in the TU Delft Open Jet Facility. PIP is a test platform that can take a freefall from apogee to deploy the parachute relatively late and is based on a heavily modified CanSat V7. Assuming International Standard Atmosphere conditions, the theoretical dynamic pressure at parachute deployment for PIP is about 6000 Pa. This is comparable to the dynamic pressure of a Stratos III or Stratos IV mission where the dynamic pressure of a nominal deployment was estimated to be 7000-7500 Pa. 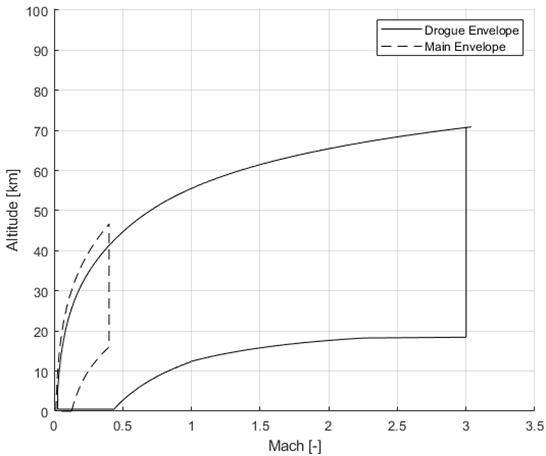 However, PIP only deploys the parachute at about Mach 0.3, which is much lower than that of flagship vehicles. Given the PIP testbed has an apogee of around 1 km, this vehicle can safely by launched in the Netherlands! To test the performance of the drogue parachute at higher Mach numbers a mission has been proposed for the German-Swedish student programme REXUS/BEXUS. The mission that is to be done is the Supersonic Parachute Experiment Aboard REXUS (SPEAR). 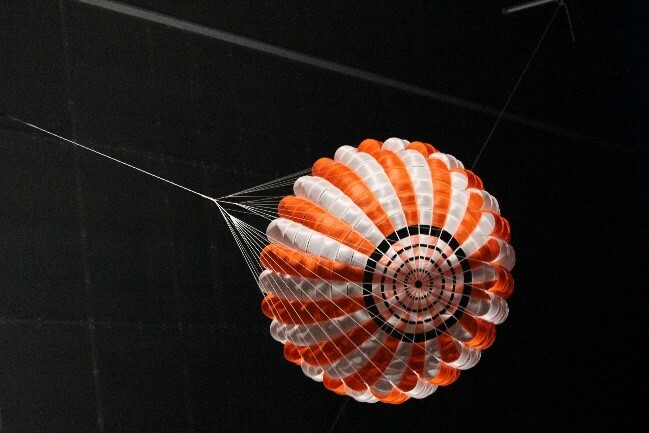 SPEAR will free fall from about 80 km and deploy the parachute around 25 km. This puts the deployment conditions at about 6000 Pa and Mach 1.5. The third test vehicle used by the PRG is the Aether launcher, developed by DARE. Aether is, unlike SPEAR and PIP, not an internal mission, but a flagship mission of the society. More information on the project can be found here. As can be seen in the table below, the three test facilities give good coverage of the envelope of the Stratos recovery system. This combination of unique and flexible test options allow the team to be very prepared for a wide variety of missions. This gives PRG the confidence that we can bring any payload safely back to Earth! Overview of the different parachute testbeds used by DARE.